Lying on the south bank of the Missouri River, near the western edge of the state, Independence, Missouri was originally called home to the Kanza and Osage Indians, who called the area Big Spring. Few towns its size can claim such a rich history. The first explorers to the area were the Spanish, followed by the French. The region became American territory with the Louisiana Purchase in 1803. In 1804, Lewis and Clark recorded in their journals that they stopped here to pick plums, raspberries, and wild apples. On August 10, 1821, Missouri became a state and through the Treaties of 1825 with the Osage and Kanza Indians the U.S. government took control of the area. Jackson County was organized on December 15, 1826 and the land was opened up for settlement. Searching for a site for the county seat, the Missouri General Assembly chose Big Spring, and on March 29, 1827 authorities approved a 160-acre site which became Independence. In the meantime, William Becknell had blazed the Santa Fe Trail in 1821, from Franklin, Missouri, some 100 miles to the east, passing right through the area that would later become Independence. As the town grew, it soon became the eastern terminus of the Santa Fe Trail. In 1831, a boat landing was established at Blue Mills on the Missouri River, six miles distant. The business increased and the government established a customhouse for the accommodation of the early merchants. In 1830, missionaries of Latter Day Saints (Mormon) began moving into the area, in hopes of converting the Indians living in western Missouri and eastern Kansas. Church elders from Ohio chose the growing frontier town as their base. The following summer, in August, 1831, founder and prophet, Joseph Smith, Jr. visited Independence and declared it to be the location of Zion, God’s city on earth. 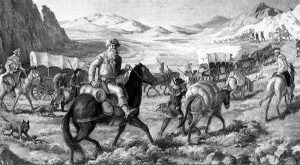 When the news spread that Zion had been found the Mormons of Ohio, Illinois and New York began an exodus to Jackson County. Smith purchased forty acres of land for the temple just west of the courthouse in Independence. The country around Independence soon was settled with Mormons, who built numerous homes, churches, mills, established businesses, and began one of the first newspapers — the Evening and Morning Star, established by W. W. Phelps. Though the article was written to curtail trouble, it had the opposite effect, so outraging local citizens that more than 400 met at the courthouse to demand that the Mormons leave. When the church members refused to negotiate away or abandon lands they legally owned, several citizens formed a mob, destroyed the press and printing house, ransacked the Mormon store, and violently accosted the Mormon leaders. Bishop Edward Partridge was beaten and tarred and feathered. Meeting three days later, the mob issued an ultimatum: One-half of the Mormons must leave by year’s end and the rest by April, 1834. The church members decided to stand their ground and seek redress through the courts. The Gentile settlers; however, were having none of it. In October, they mobilized again to drive the Mormons out. 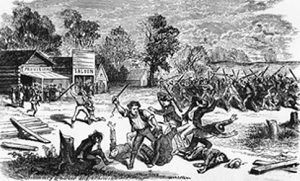 On October 31, 1833, they attacked the Whitmer settlement a few miles west of the Big Blue River, demolishing houses, whipping the men, and terrorizing the women and children. The attacks and depredations against church members continued throughout the next week resulting in the deaths of two Missourians and one defender. The county militia was finally called out to quell the mob and negotiate a truce. When the church members surrendered their arms to the militia, the troops joined the mob in a general assault against them. The terrified church members, numbering about 1,200, then fled Jackson County in disarray. Most went north, across the Missouri River, and sought refuge in Clay County. leaders were taken prisoners, but most of them subsequently escaped. 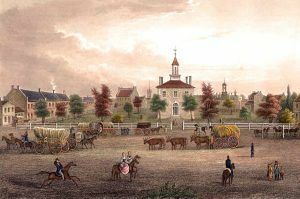 The rest of the Mormons of Missouri, who had grown to more than 12,000, emigrated in the winter of 1838-39 to Illinois, where they formed the town of Nauvoo. The lot that the church had purchased on which to build a temple was sold for taxes. By 1835 the growing frontier village had a second road surveyed and built southwest of town towards Santa Fe, and the town’s trading strength was reinforced by Mexican merchants who came northeast along the trail. Independence was the farthest point westward on the Missouri River where steamboats or other cargo vessels could travel and trade flourished in the city, accommodating fur traders, merchants, and adventurers. Large freighting wagons rolled past the courthouse square to and from Santa Fe for the next two decades. 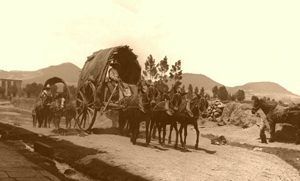 Beginning in the early 1840s, tens of thousands of emigrants came to Independence from the east to get outfitted and depart west on the five-month, 2,000-mile trek along the Oregon and California Trails. The city soon became known as the Queen City of the Trails as goods and services were provided for travelers beginning their long journeys. “Colonel Owens’ acquaintance with the traders did much to retain Independence as the ‘entropo’ into Mexico, and until the troubles between the United States and Mexico began in 1845-46, other places were not used. In the year 1846 it was determined by the United States to send troops across the plains to overcome opposition. Doniphan raised a regiment of men which, being fully equipped, took up the march from this country. Quite a number of adventurers of all sorts accompanied the troops. Owens and Aull decided to send a wagon load of goods along, and Mr. Owens and James Aull took charge of it. Everything promised well and no opposition was met with until within sight of the Sacramento plains, between Santa Fe and Chihuahua, where the Mexicans were drawn up for battle.